As it is with many other areas of human endeavor, the discussion of the merits of the many different models of electronic cigarettes frequently revolves around form versus function. Function has got to be the most important consideration in an electronic cigarette, but I prefer that functionality to be wrapped in a sleek package. Shiny is good, too. Chrome is even better. You get the idea. I like an electronic cigarette that works well, but I am always attracted to a great looking design. The CRV 900 line from SmokTek is a great looking electronic cigarette design and immediately caught my eye when I first browsed the SmokTek site. It’s sleek, shiny and comes in five colors including wine red and the chrome that I purchased. The design is much like other eGo-style big battery models, but the CRV 900 is set apart by the concave area around the switch housing that gives it a distinctive appearance. SmokTek has made it a point to offer well equipped kits and the CRV 900 is no exception. The CRV 900 Deluxe Cartomizer Kit includes everything needed to get started with an electronic cigarette except the e-liquid, which SmokTek also carries. 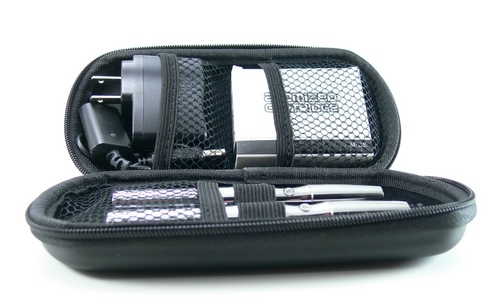 Included are two complete CRV 900 electronic cigarettes, five 2.0ohm cartomizers and a USB charger with wall adapter. Everything is packaged in a sturdy zippered carry case. Just add 30ml of e-liquid to get started and you’ll be ready to vape. The addition of cartomizers to a starter kit rather than atomizers makes for a very easy introduction to electronic cigarettes and also adds value for veteran vapers. The cartomizers included with the CRV 900 are easy to fill and use. See Cartomizer Filling for Electronic Cigarettes for more detailed information on that subject. The 2.0ohm cartomizers are a great fit for the CRV 900 and nicely match its power output, which we’ll get to in a moment. 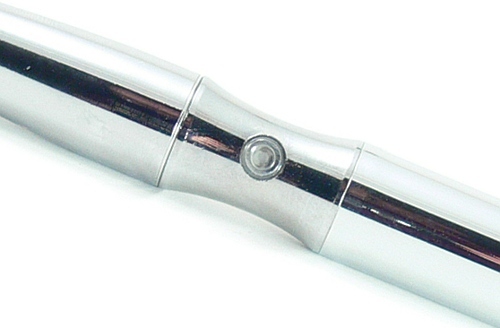 And lest we forget, the stainless steel cartomizers look great with the chrome cone. The addition of a chrome drip tip available separately is also a great looking addition. In terms of size, the CRV 900 batteries are just what is expected in a 900mAh electronic cigarette battery. Fully outfitted with a cartomizer the overall length comes to 134mm. That length makes the CRV very comfortable to hold like a cigar, and this is where the concave area around the switch adds to the overall experience. 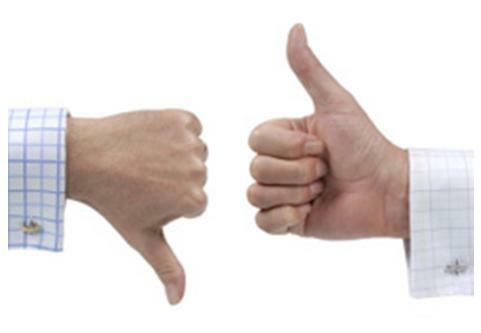 When depressing the button with the thumb, the indentation makes a very comfortable place to rest the forefinger. It also seems to help prevent unintentional activation of the switch. The CRV batteries go one step further in this regard by incorporating a 5-click shutoff feature that disable the batteries when not in use. Five more clicks turns them back on. 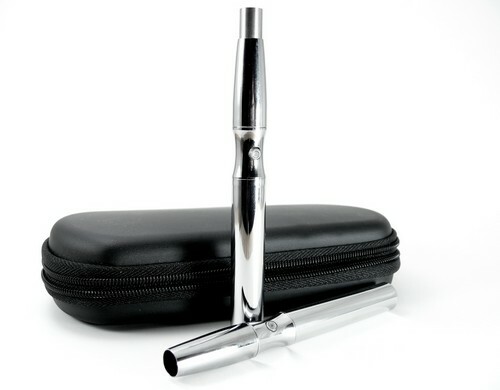 The feature makes for a very pocket-friendly electronic cigarette. While the CRV 900 batteries look a little different than the average eGo or Riva, it is nice to see that the threading is similar. The connector threading is standard 510, meaning that these batteries are compatible with the wide range of 510 atomizers and cartomizers that are available. The outside threads are the same as a standard eGo as well, ensuring compatibility with an even larger array of cones, mega atomizers and mega cartomizers. As mentioned before, function is an important part of electronic cigarette design, and it is in this area that the CRV 900 receives it’s only negative mark. Fresh off the charger, the batteries out put around 3.5 volts which is comparable with others in this class of electronic cigarette. With a 2.0ohm cartomizer attached, however, voltage drops to around 3.0 volts, which is below average for this class. Performance with the 2.0ohm cartomizers is actually quite good at this voltage and will be quite satisfactory for many vapers. The combination yields a very satisfactory mix of flavor, throat hit and vapor. The 900mAh batteries provide a sufficient amount of usage between charges to last an average vaper all day. After several weeks of usage, the CRV is holding up well both in terms of performance and appearance. The CRV 900 Deluxe Cartomizer Kit from Smoktek is a very well equipped kit built around a great looking device. This kit would be an excellent choice for a new electronic cigarette user. With the exception of e-liquid, everything needed to get started with an electronic cigarette is included for less than $60. The excellent finish and unique design will appeal to veteran users as well, but the slightly lower than average voltage may be a turn-off for some. Yet another awesome review, partner! Too bad the subject of the review has that Achilles Heel, which for me is a deal-breaker. Do you know who manufactures the CRV 900 or those 2.0 ohm cartomizers?